Right now, at Regional Health hospitals there are caregivers working to save the lives of kids in your community. Every day children enter our hospitals for treatment— adding up to thousands of kids each year. Some are battling cancer. Some are suffering from a traumatic injury. Others require constant care because they were born too early, or with a genetic disease. Regardless of why the kids are there, our Children’s Miracle Network Hospital always has its doors open. These hospitals work wonders daily for kids. But, even small wonders don't come easily. They require the skills of doctors and the nursing staff dedicated to caring for all the children and they require life-saving equipment. Thanks to generous donations just like yours today, Children's Miracle Network helps to provide such vital equipment for children in this region as well as fund critical treatments and healthcare services. 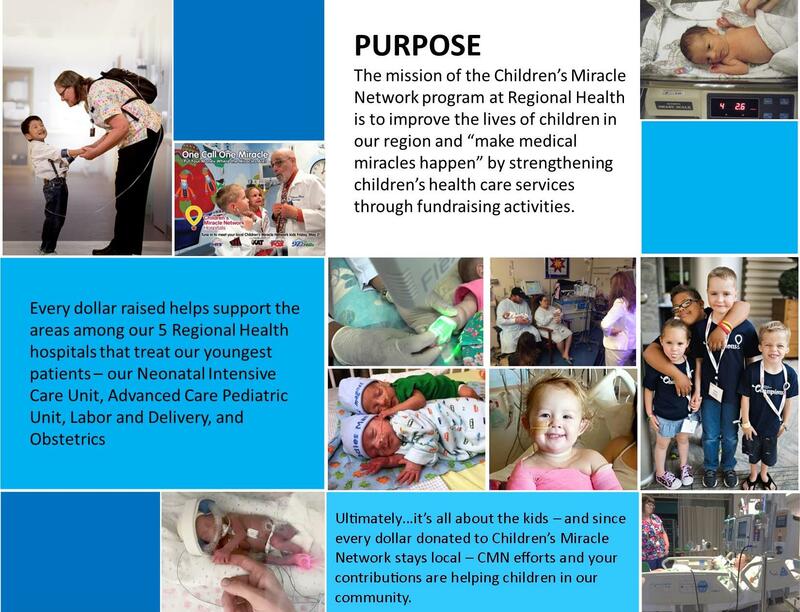 The Children’s Miracle Network Radiothon will broadcast live from the Regional Health - Rapid City Hospital lobby on Friday, May 10 from 6 a.m. – 6 p.m.
HomeSlice Media Group Radio Stations 93.9 The Mix; KAT 98.7; Real Rock, 100.3 The Fox; and Hot 93.1 will all present miracle stories featuring children from the area. Children and their parents will also be interviewed live on the radio stations and talk about how families in our region benefit from community support through donations to Children’s Miracle Network. Money raised through the Radiothon helps Children’s Miracle Network purchase medical equipment and fund programs for children’s services. Every dollar stays local helping ill and injured children every day! Join us in our mission to save and improve the lives of as many children as possible. Donate or join the campaign and your own fundraising page on behalf of Children's Miracle Network!